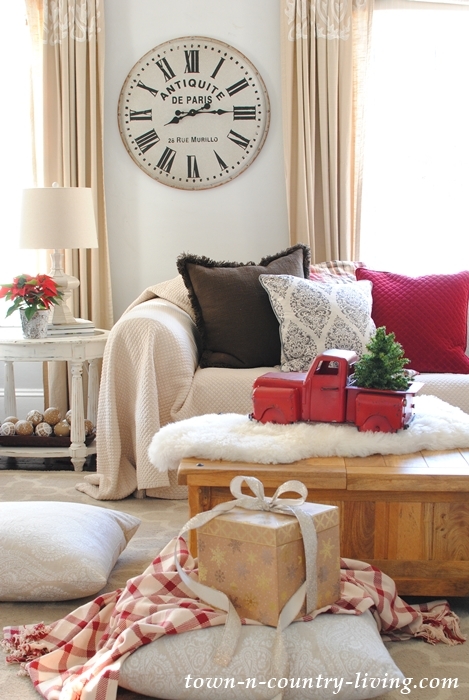 My vintage-style red truck is the focal point and inspiration for this room. 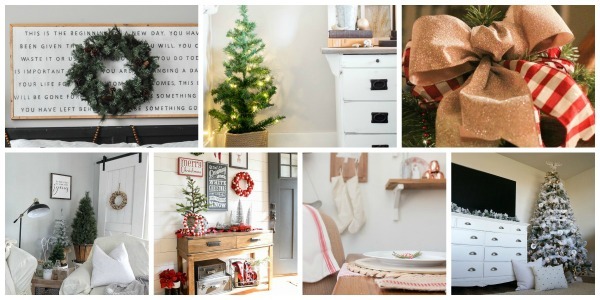 Christmas decorating is simple yet festive in the family room. 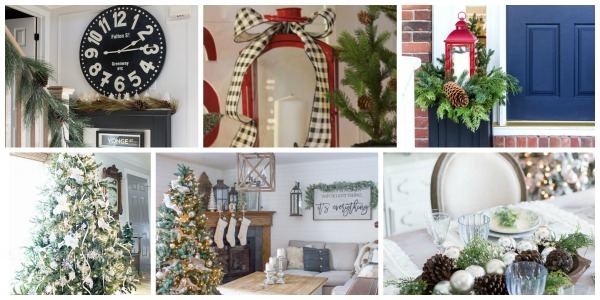 You can enjoy other decorating ideas by visiting the other bloggers that I’m joining at the end of this post. 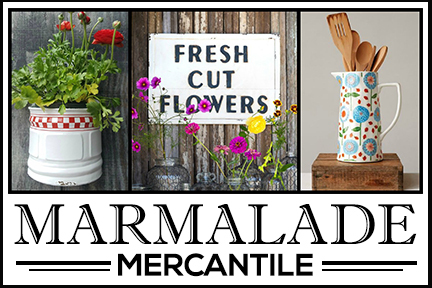 A hearty welcome to those of you visiting from Amanda at Sincerely Marie Designs – I love everything she does! 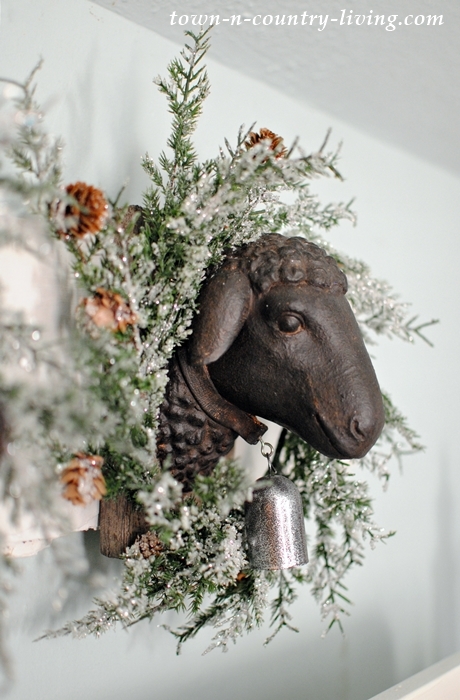 And a big thanks to Jenna at Wife in Progress for organizing today’s holiday farmhouse tour! 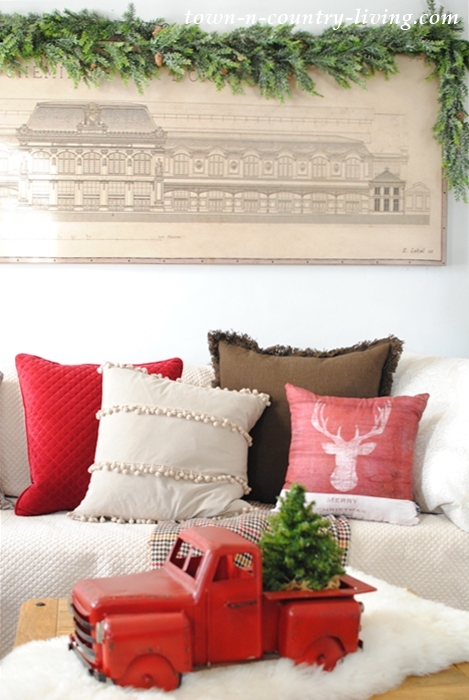 A healthy dose of garland adorns the architectural Paris train station print while holiday pillows lend color to the couch. I decided to keep the browns and neutrals in my family room for Christmas while adding a few pops of red. 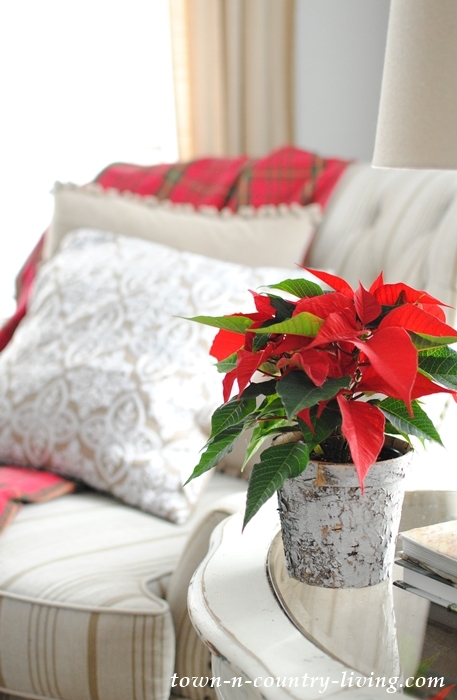 Traditional red poinsettias make an appearance in the room and add a touch more color. 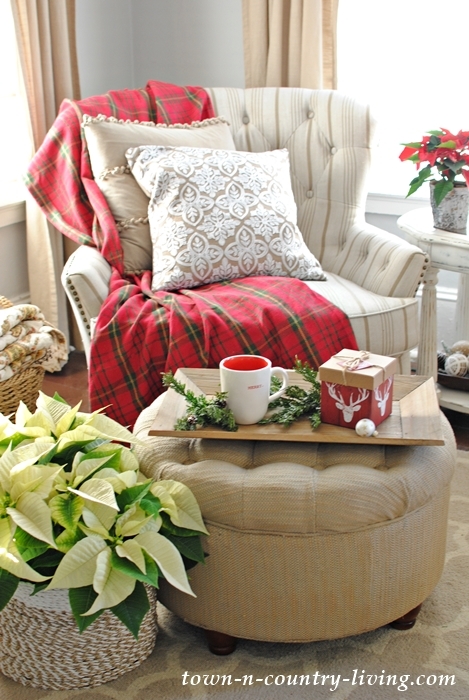 My all-time favorite Eliza chair from Pier 1 is decked out for Christmas with a red and green plaid throw. 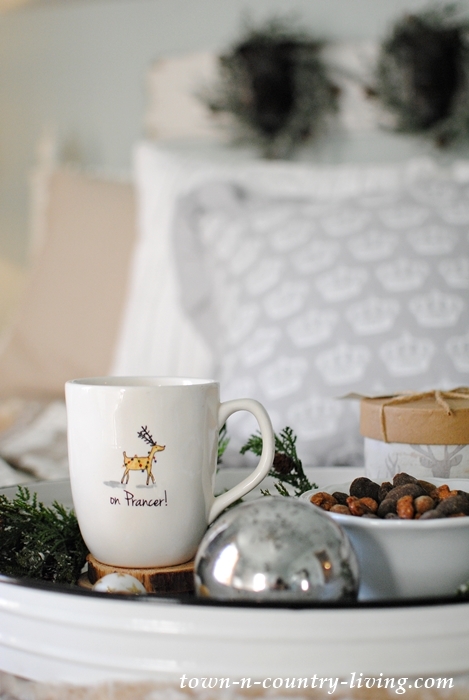 Add a whimsical Christmas mug filled with creamy coffee and I’m ready to curl up with a good book. Soft, muted tones appear in our under-the-eaves bedroom. A bough of greens and white bells adorns the tobacco basket. Favorite magazines are read over and over. Some of my Country Living issues go back to the early years of 2000. A tray of snacks ensures I won’t have to leave this haven for a while. 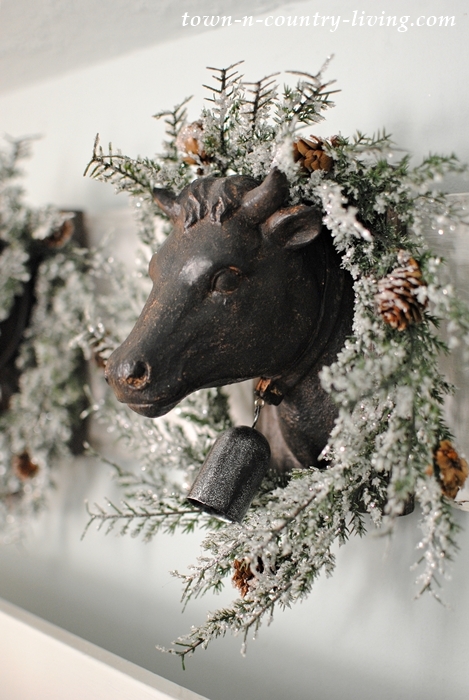 Frosty wreaths encircle the farmhouse animal heads. I think these guys are so cute! 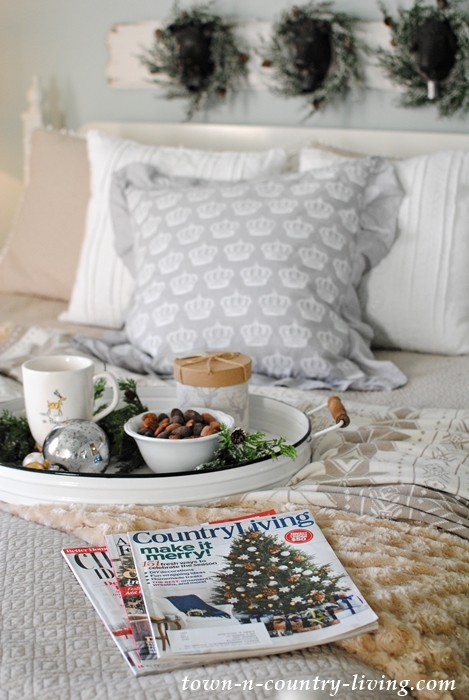 The nightstand is simply adorned with a small Christmas tree in a burlap sack. 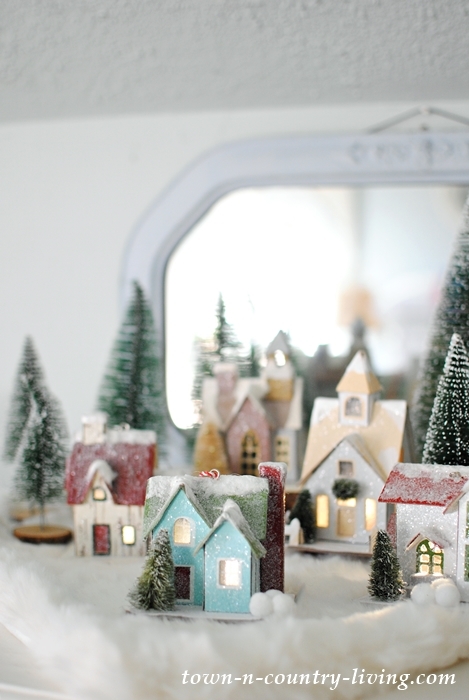 A miniature Christmas village sits atop a bedroom dresser. I have a weakness for little Christmas houses. Simple and serene. 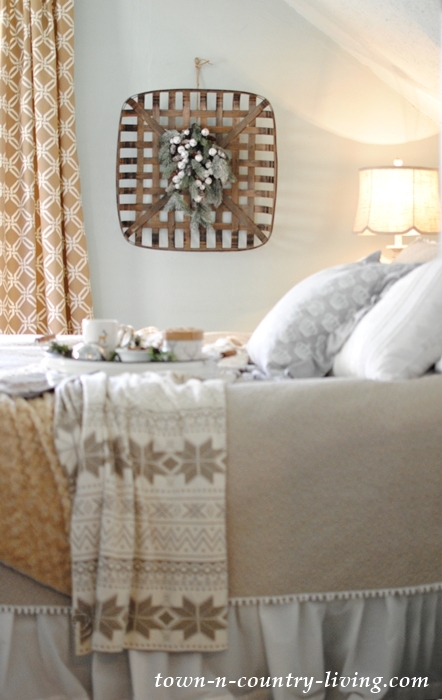 Another room to retreat to for casual Christmas comfort! 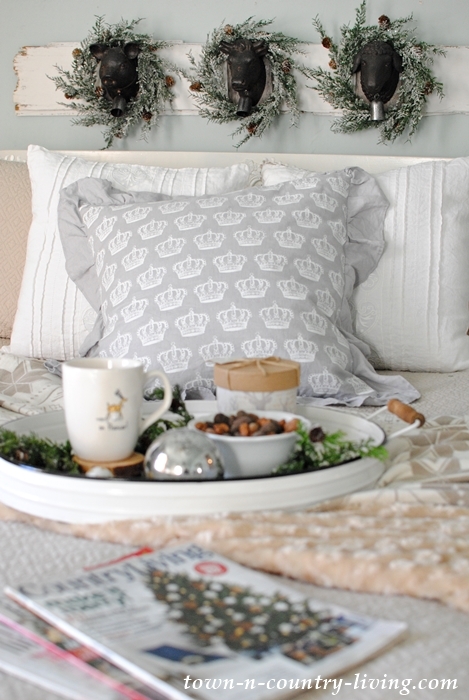 See the first part of my Christmas Home Tour that was featured last week. I also shared a Cozy Corner by the Christmas tree. 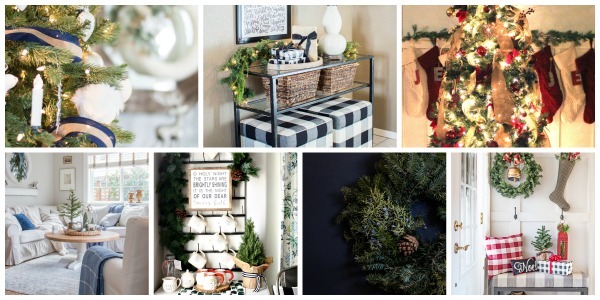 Are you ready to head over to the other homes for more holiday inspiration? 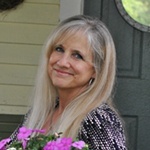 Next up on the tour is Lisa from Farmhouse on Boone – she’s another blogger whose style and home I love. Everything is so beautiful. 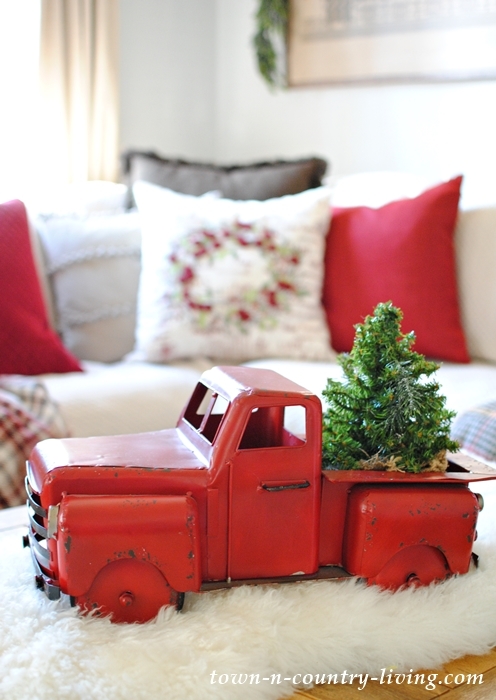 I love all the wonderful pops of red, so warm and cozy looking and that red truck is perfect. You’re home is gorgeous, as always, Jennifer! 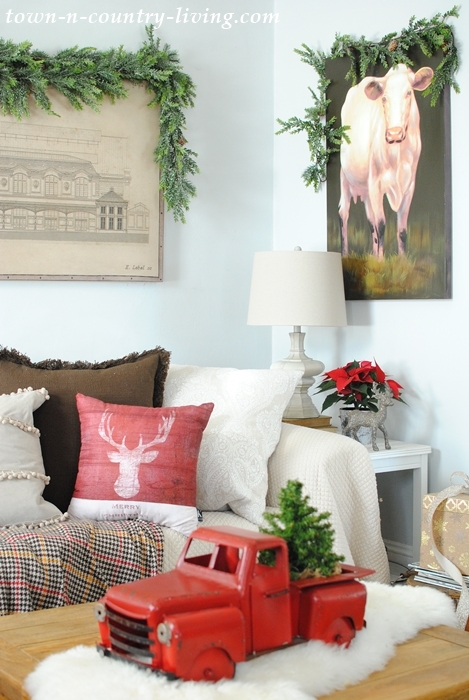 I love how you used that darling truck as inspiration for your living room. I love all your animal decor and coziness of all your rooms and that pop of red. 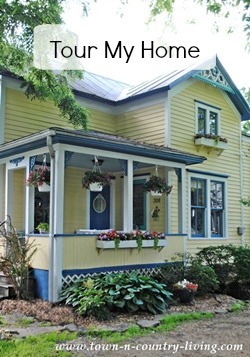 I love your home and style. Oh Jennifer, another beautiful tour, my friend! I always look forward to your tours. 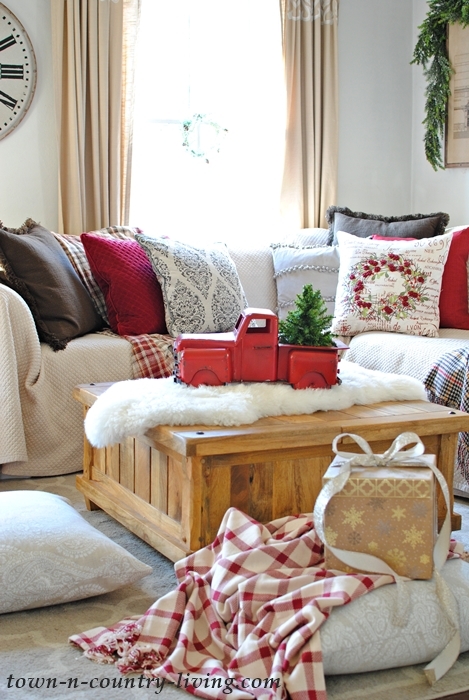 You know how to do cozy and festive perfectly! So glad we could blog hop together! 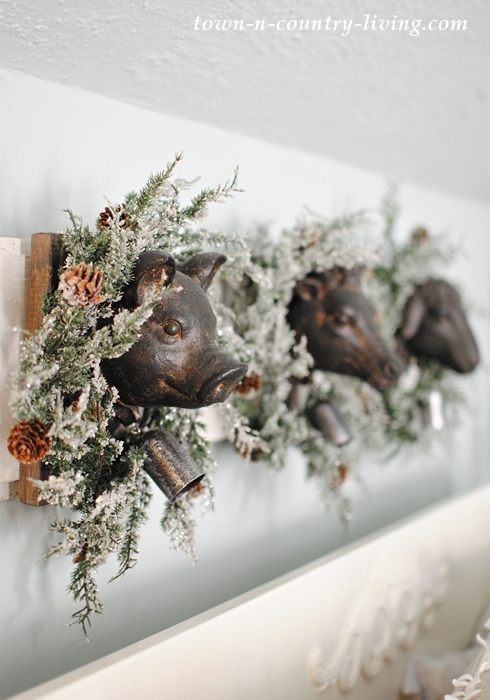 Jennifer, I love your animal heads with the frosted garland. 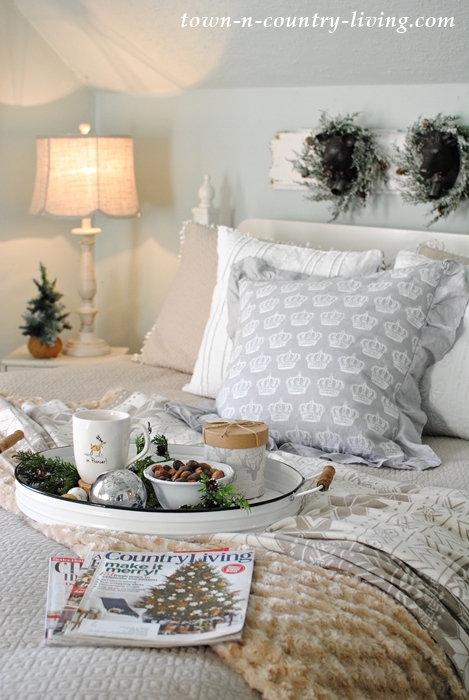 The cozy blanket throw is perfect for snuggling and enjoy your little snacks. What’s more Christmasy than poinsettias? 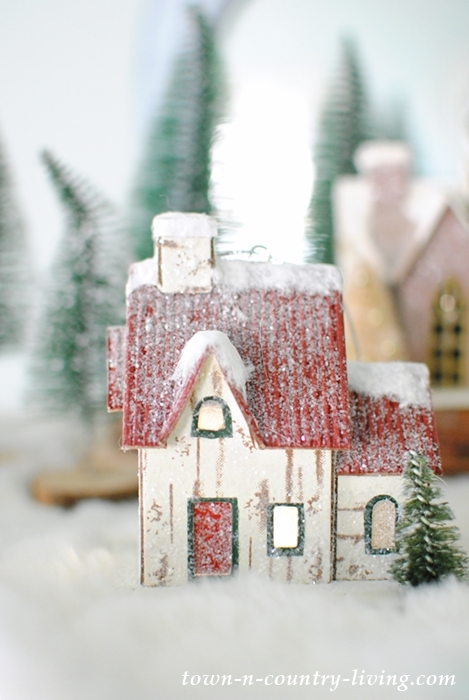 Your sweet little houses are like a winter wonderland. 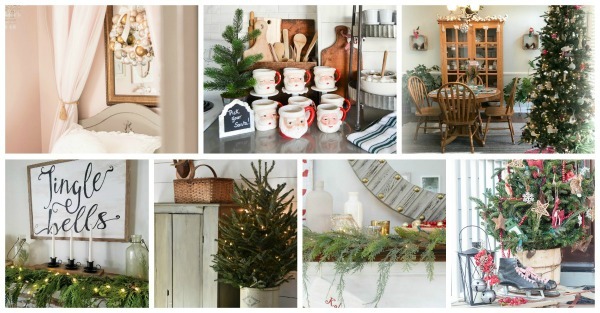 So happy to be sharing the home for the Holidays blog hop with you. I’m not one to be big on “neutral palettes” in decorating because it seems so trendy; but you have pulled it off spectacularly in your Christmas decorating this year! With so much blue/white in my home I have to decorate with metallics and lots of frosted greenery. It has been motivating to see how you are using these items with your color schemes. Thanks!! Beautiful tour! 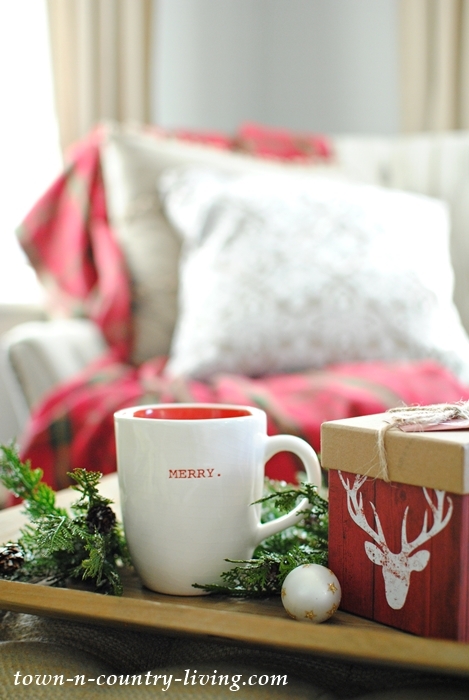 So cozy and festive. I love my magazines, too, and save old issues to read over and over. 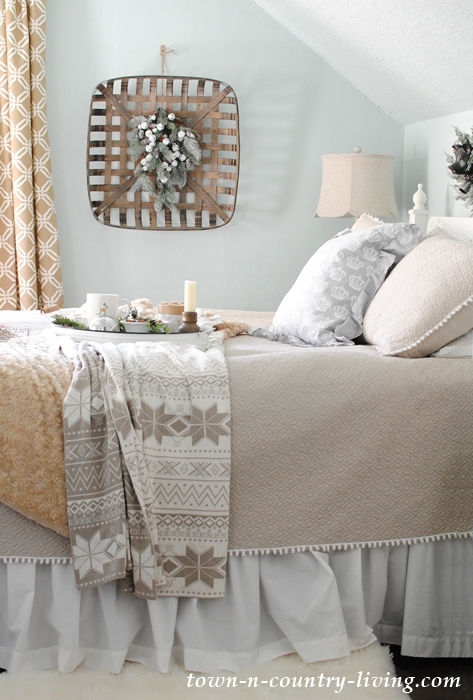 This is so pretty and COZY! Love all the pillows on the couch. 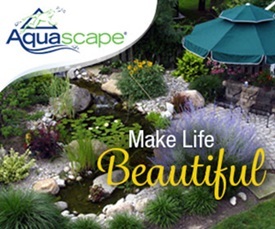 Your home looks beautiful, Jen! I LOVE that little red truck! Everything looks so cozy! I love that red vintage truck and the Paris train station print! How serene and cozy! And that red truck is so cute! This is so beautiful, my friend! I want a red Christmas truck like this one! It is so incredibly cute! I love how cozy your home is! I totally agree with you, Jennifer – wouldn’t it be nice to have a longer Christmas season and not be in a such an awful rush. 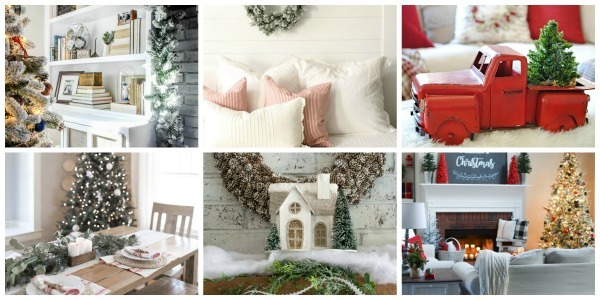 Your home is dressed wonderfully for Christmas and I love all your touches. Where in the world did you find those ADORABLE little animal heads??? I can not even pick a favorite photo, because they are all just so amazing and beautiful! Pinned! I love it all! That print is amazing! Love that garland! Could you share where it’s from?